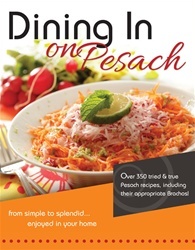 Sample over 350 tried and true Pesach recipes, including their appropriate brachos! In response to the overwhelming success of Dining In and Dining In Again, Yeshiva Masoras Avos is proud to bring you this delightful Pesach cookbook. A must have for great recipe ideas, Dining In on Pesach will help you enjoy a kosher and delicious Yom Tov again and again. Be amazed at how you can turn a few humble ingredients into an enticing dish that will delight your family and guests. 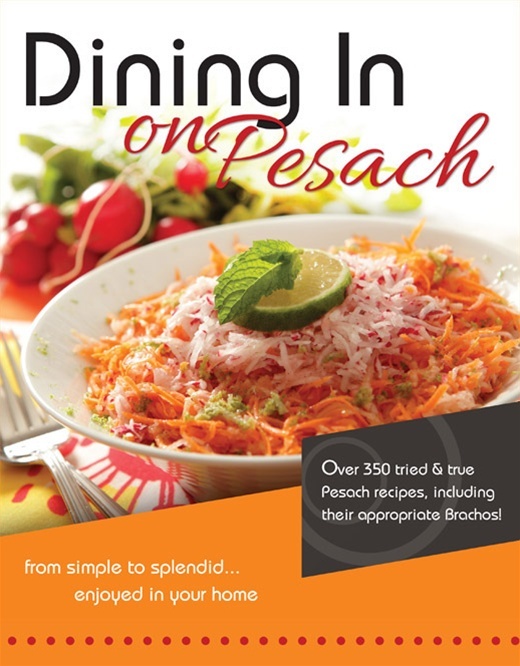 Dining in on Pesach features over 350 fantastic recipes that run the gamut from sophisticated dishes that you wouldn’t believe possible on Pesach to delicious recipes for those who only use unprocessed foods on Yom Tov. An invaluable tool for Pesach, this highly readable and engaging masterpiece is chock full of fabulous photos. This beautiful cookbook will become your Pesach kitchen companion.